The series of gaffes include dueling messages about Russia sanctions and botching the date of Barbara Bush's death. The late great newspaper columnist Jimmy Breslin wrote “Can’t Anybody Here Play This Game?” about the woeful 1962 New York Mets. But he could have been writing about the Trump White House. In recent days, there have been a series of embarrassing gaffes and unforced errors from President Donald Trump and his already chaotic administration that have inspired a fresh round of head-scratching inside the Beltway and beyond. For example, the White House issued three separate statements on the death of former first lady Barbara Bush, who died on Tuesday at age 92. One was from the president and first lady, one was just from first lady Melania Trump, and the other was from the Trump campaign. And all of them were dated April 17, 2017, instead of April 17, 2018. Trump himself was to blame for another gaffe. 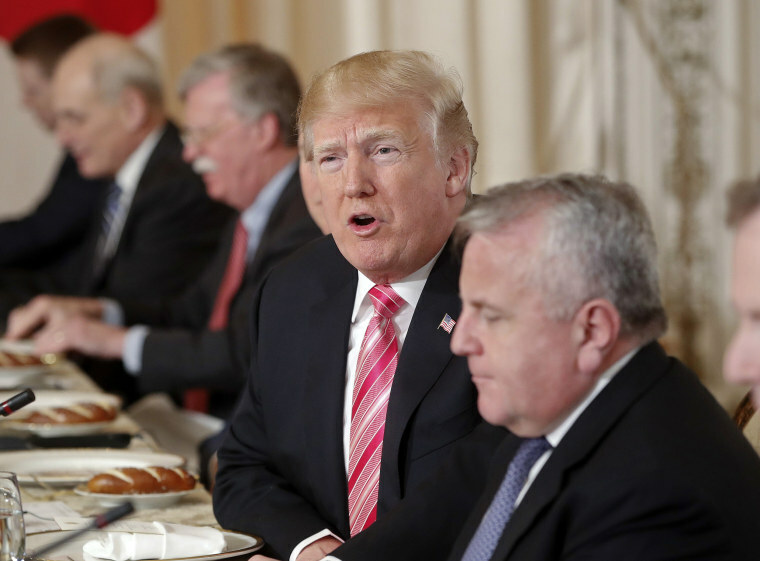 Following revelations that CIA chief Mike Pompeo had made a secret trip to North Korea, Trump on Tuesday answered “yes” in response to a shouted question from The Associated Press about whether he, too, had spoken directly to the country’s leader, Kim Jong Un. At the time, Trump was in the midst of a “friendship walk” for the cameras with the first lady and the Japanese prime minister, Shinzo Abe, and his wife, Akie. Not sure whether Trump had understood the question, the pool reporters repeated the question again while the president was seated for dinner. A senior White House official later admitted to NBC News that Pompeo’s meeting with Kim Jong Un actually took place over Easter weekend, March 31 and April 1. Trump’s newly minted White House economic adviser, Larry Kudlow, also got dragged into the gaffe machine. It began on Sunday, when U.N. Ambassador Nikki Haley said on "Face the Nation" that Treasury Secretary Steven Mnuchin would be announcing new sanctions directed at Russian companies associated with Syria's chemical weapons program on Monday, "if he hasn't already." Later Tuesday, Kudlow apologized to Haley.